Here's the final stage in making this fresh pumpkin pie. 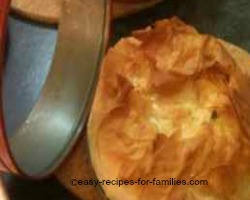 At the conclusion of this stage of this pumpkin pie recipe, you'll have plated this very attractive filo pastry pie. 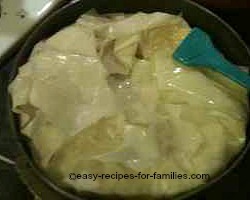 The pumpkin pie is wrapped in 15 layers of prepared filo pastry on its way to being a perfect pumpkin pie. 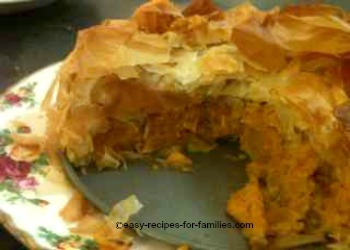 It is filled with a delicious filling of fresh pumpkin and marinaded chicken. Using a pastry brush, brush oil onto the filo sheets, taking care to get into every nook and cranny. 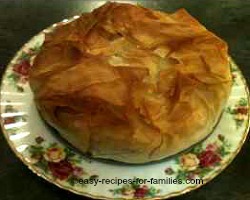 The oil is important in this process as it adds moisture to the pastry and helps with browning. You may use a can of spray of oil. Be sure to apply liberally. 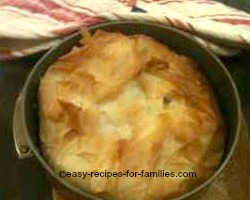 Place the glazed pie into a preheated oven at 360F/180C. Preheating the oven is important so that the temperature is evenly distributed in the oven cavity. Place the spring form pan in the lower center of the hot oven. Bake for 45 minutes till it is a lovely golden brown. Look at this - fresh out of the oven and just beautiful! Leave the fresh pumpkin pie to rest for 10 minutes while it cools. Release the spring on the spring form pan. 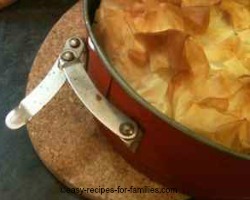 This loosens the walls of the pan, while the pie continues to sit on the base. While holding the base, lift the loosened pan off from the top and remove it. 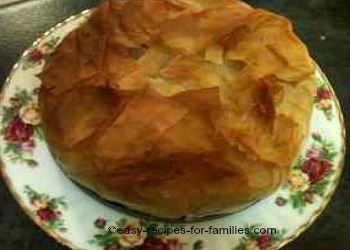 Place the pie on the spring form base on a lovely plate. There you are...how simple was that! Your lovely elegant diabetic pumpkin pie cooked with fresh ingredients, looks sensational and is ready to be served. hundreds of wonderfully simple to make tasty one pot meals prepared in a flash.